As the holidays approach, we tend to get wrapped up in the festivities and forget that our homes can contain huge risks for our pets if we aren’t careful. 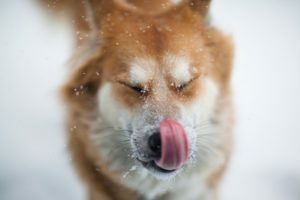 Washington State University’s College of Veterinary Medicine shared a helpful article outlining some of the main hazards pet owners should look out for during the end-of-year rush. We’ve sampled the highlights for you, but we strongly recommend reading their article, too! You can find it in entirety here. Pets have been known to love chewing on decorative lights. Both indoor and outdoor lights should be carefully examined to ensure safety for your household pets. Electrical shock may occur from defective cords as well as from pets chewing on cords. Check cords for any signs of bite marks, loose or frayed wires, proximity to the tree’s water supply or evidence of short circuits. Use grounded “3-prong” extension cords and strictly follow manufacturer guidelines for light usage. Even though they have their own water bowl, there is something enticing about a novel source of water, whether it’s the toilet bowl or the Christmas tree stand. If you add chemicals to the water meant to keep your tree fresh longer, be sure to read the label to make sure it is safe for pets. Potpourri makes your house smell festive but may be another attraction for pets to drink. Make sure that potpourri pots are covered or otherwise inaccessible to pets. Antifreeze is also found in most houses during the winter season. Even a small spill on the floor of your garage could be lapped up by your pet and cause serious damage. Be careful with where your antifreeze is kept and be sure to thoroughly clean up any messes immediately. What would the holidays be without boxes of chocolate and warm cocoa in front of the fire? However, chocolate can be toxic or even fatal to dogs and cats. Chocolate may be mistakenly given to pets as treats and may be irresistible to the curious canine. 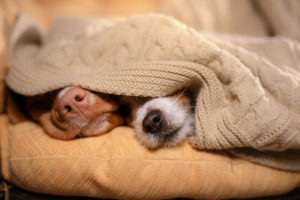 Chocolate poisoning occurs most frequently in dogs but other species are also susceptible. Poinsettias have received bad publicity in the past whereas in fact, poinsettias are not very toxic to pets. They do contain a milky sap that can irritate the mouth but if signs develop they are usually mild. Mistletoe can be very toxic to animals and you should seek veterinary consultation immediately if your pet has potentially ingested any part of the plant. Mistletoe can cause vomiting, severe diarrhea, difficult breathing, shock and death within hours of ingestion. There are many species of Holly, all of whom should be avoided by pets – the berries and leaves can be a problem although signs of poisonings are generally mild, and include vomiting, belly pain, and diarrhea. It isn’t always just food and plants that pets ingest! There is something about those shiny strands of Christmas tree decor, which drives kitties wild. 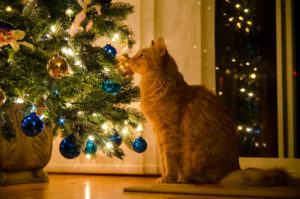 Although the sight of your cat pawing at the tree may be cute, the ingestion of tinsel can be deadly. Eating tinsel or other string-like items such as ribbon (often called linear foreign bodies) can cause serious damage to the intestine. One end can get stuck while the rest is pulled into the intestine as it contracts, and with each contraction the intestine is damaged by the foreign material. Signs of ingestion include vomiting, diarrhea, depression, belly pain and sometimes fever. Eating other holiday decorations can cause signs ranging from mild depression to severe vomiting or diarrhea, depending upon whether or not the foreign matter can be passed in the stool or gets stuck along the way. Surgery is required to remove foreign matter that does not pass out on its own. In the event your pet does ingest something it shouldn’t have, experience an injury, or simply begin to show signs that something isn’t right, don’t wait. Contacting the staff at Newtown Veterinary Hospital immediately can be the difference between a night in the hospital for your pet or a night at home on the couch. Keep them safe this year, and keep everyone happy in the process! From our family to yours, we wish you very safe and happy holiday season!